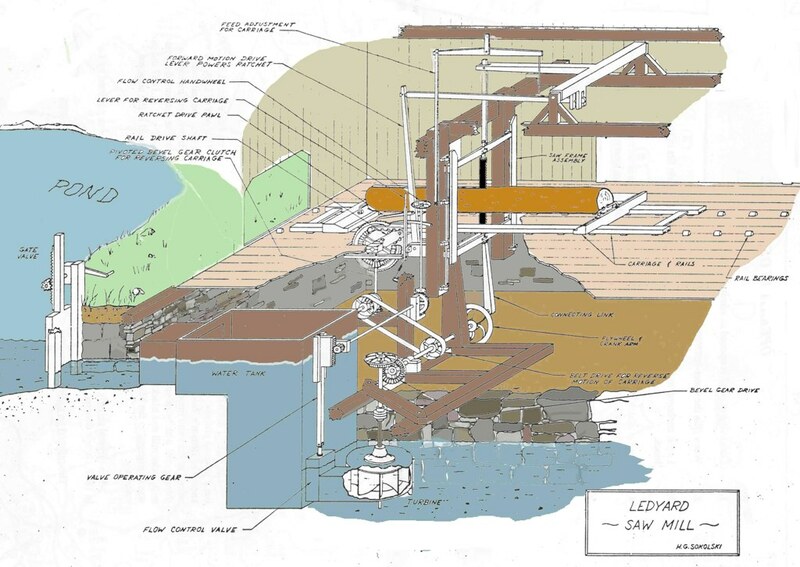 Below is a schematic diagram showing mechanism of the Ledyard sawmill. Click on it to enlarge. Following the diagram is an explanation of each of the subcomponents with recent photos and videos of the actual machinery. How is the saw powered? 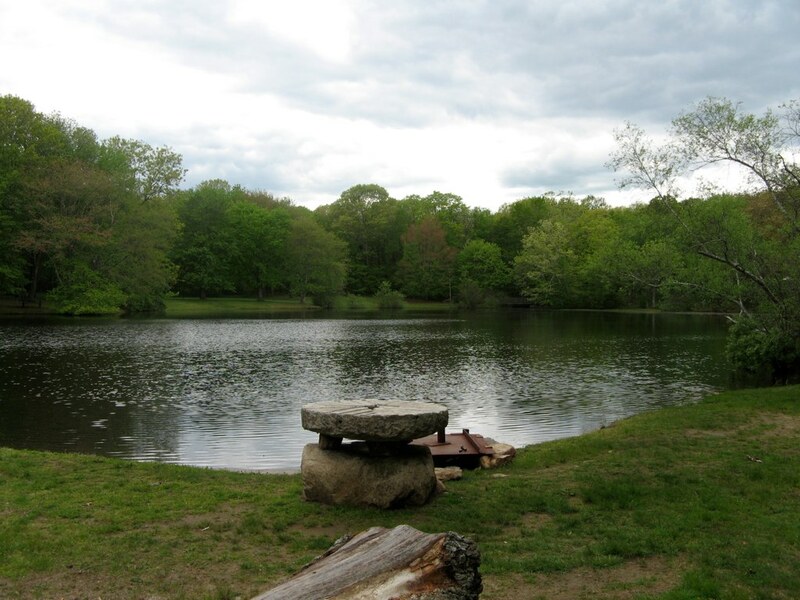 Lee's Brook was dammed to create a mill pond that provides water to power the mill. 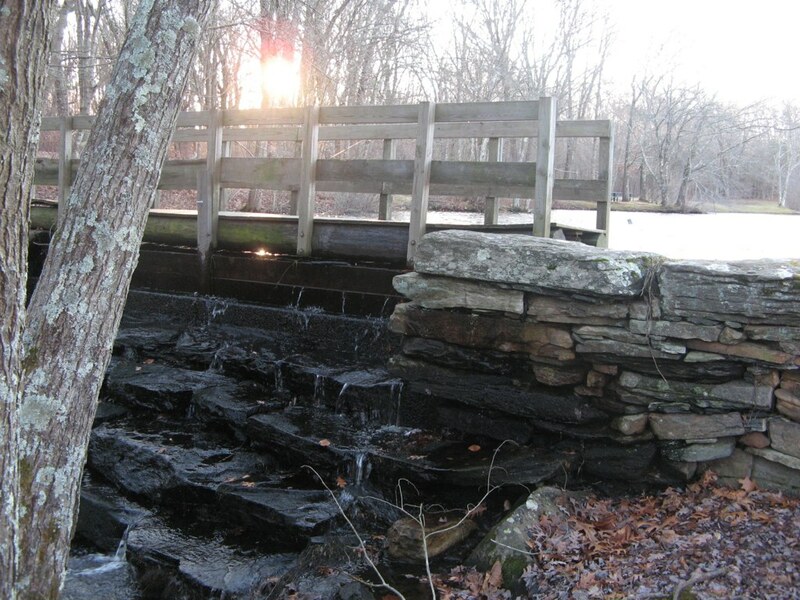 When the mill gate in the dam is opened, water from pond flows through the headrace in the dam into a tank on the lower mill level. When a second gate at the bottom of the tank is opened water flows into a horizontal turbine, spinning its rotor at approximately 100 rpm. The saw is started and stopped by operating a handwheel that opens and closes this lower gate. Water exits the turbine and flows through the tail race, a channel cut through the basement of the building, before joining the outflow from the pond. See blue section of schematic diagram for details. The horizontal water turbine was made by John Tyler of Claremont, New Hampshire in the late 1860s or 1870s. Water flowing against the blades of the turbine's rotor drives a horizontal bevel gear that connects to a mating vertical bevel gear on the main shaft. At the other end of the main shaft is a massive iron flywheel that builds momentum to drive the saw when cutting. A pitman arm connects the flywheel to the wooden saw sash, converting the rotary motion of the flywheel into an up and down (reciprocating) motion. The diameter of the flywheel and the point of attachment of the pitman arm determine the length of the vertical stroke which is about 24". 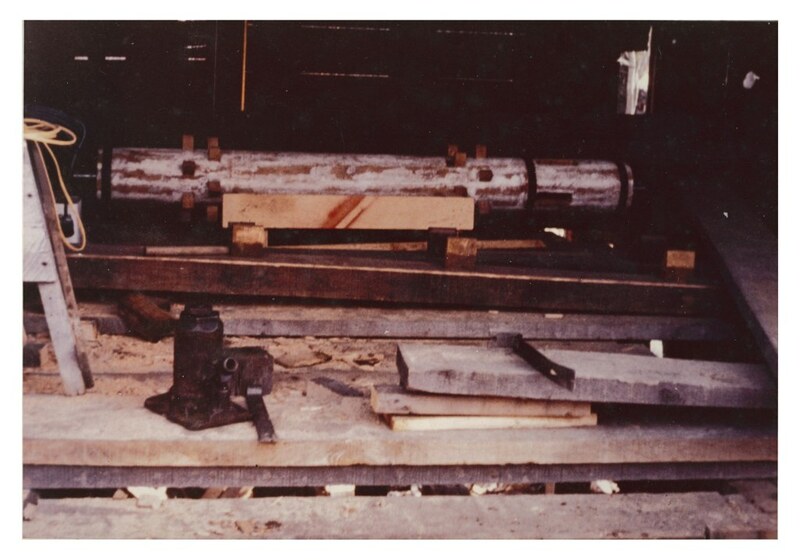 A take-off pulley on the main shaft provides power via a connecting belt to a mechanism used to back up the log carriage when a cut is completed. (These parts and wooden tank surround can be viewed on the lower mill level.) See white parts of diagram and follow the shaft from the top of the turbine to the saw frame to trace the transmission of power from the flowing water. How does the saw cut? The saw is held in a frame called the"sash," because of its resemblance to a window sash in a double hung window. The internal dimensions of the frame are 75" vertical X 60" horizontal, setting the limits for the length of the blade to six feet and three inches. The frame's up and down movements are guided by friction tubes attached to the fender posts, large (8" x 8") vertical structural posts. Oak blocks on the saw frame act as sliding bearings on the friction tubes. They are regularly coated with grease. Yoke-stirrup assemblies at the top and bottom of the frame hold pins that pass through the saw blade and screws that clamp the blade from both sides. Nuts at the top and bottom can be tightened to apply tension to the blade. Tension keeps the blade from bending, twisting and wobbling in the cut. The blade is frequently removed for sharpening and must be aligned so that is parallel to the friction tubes and the direction of travel of the log carriage. See tech notes for details about saw blades and what is done when mounting a blade in sash. The blade cuts only on the down stroke, making an approximately 1/4" kerf (width of cut). Consequently, after four one inch boards have been cut, another inch of the log has become sawdust. 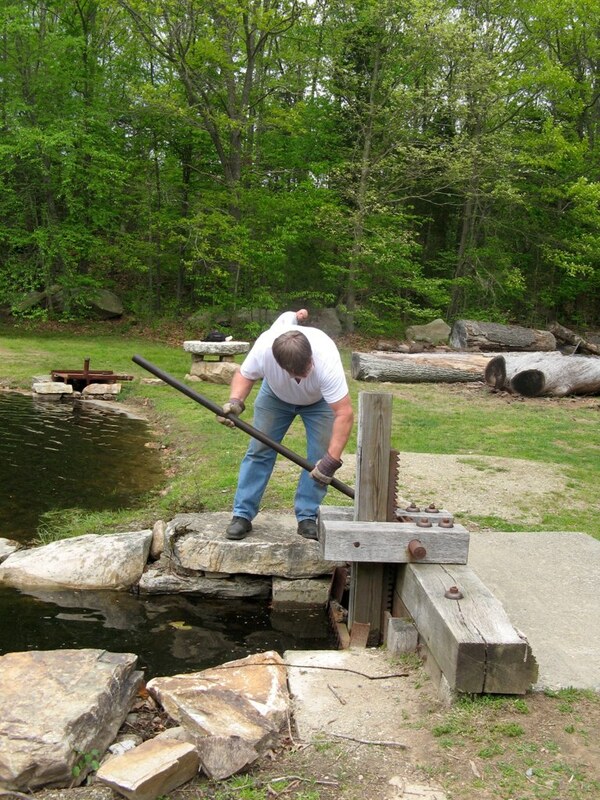 When the pond is full, the saw cuts at about 100 strokes/minute. The cutting rate is adjustable upward from about one foot/minute, depending on water levels, hardness of the wood and sharpness of the saw. The length of the cutting stroke is 24 inches, but because the blade is almost 72 inches long, logs approaching 48 inches in diameter can be cut. However, the saw must have deep gullets between the teeth and be set so that sawdust is carried away. Otherwise it accumulates in between the teeth and starts to bind the saw. 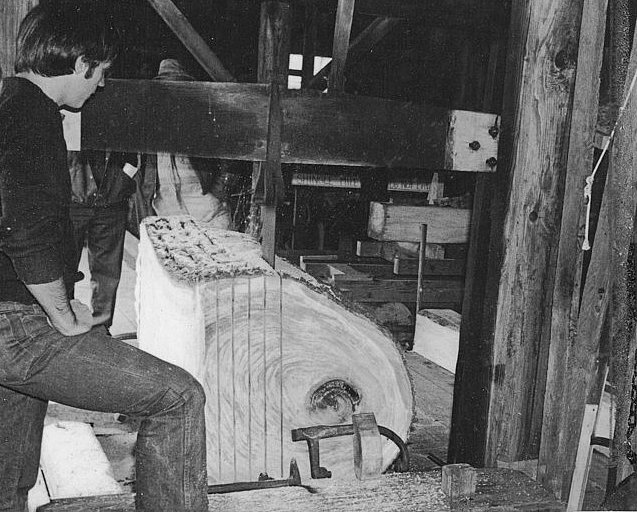 The largest log cut was a pine log about 42 inches in diameter. The carriage can hold logs up to about 20 feet long. Video shows a 12 foot long red oak log has been squared to about 20" X 20" and now boards are being cut with square sides. Note the cutting on the down stroke and how the carriage moves on the up stroke, advancing the log for the next down-stroke cut. Advancement is adjustable from a minimum of about 1/8" to about 1/2" (?). Advancement is kept at a minimum when demonstrating the saw to reduce the strain on the historic mechanism. The blade is canted forward at the top by about 1/2" (+ or - 1/8"). Consequently, it clears the log as the saw rises and the log is advanced. During the down stroke, the carriage and log are stationary. To advance the log into the saw, the movement of the carriage is synchronized with the stroke of the saw. As the saw rises, a connecting arm raises a long rocker arm attached to a pivot beam. See white areas on the schematic diagram for details of connecting linkages. As the beam pivots on its end bearings, a second shorter vertical rocker arm extending from the pivoting beam swings back and forth at a frequency determined by the saw frame's up and down motion. 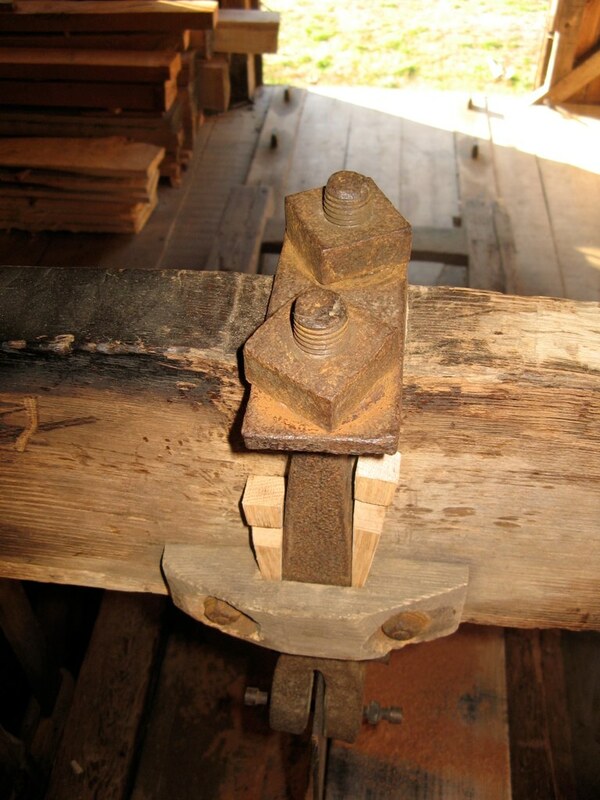 A second connecting link from this short rocker arm pushes or pulls on the top of a post that is hinged at its base, causing it to move back and forth in synchrony with the saw stroke. 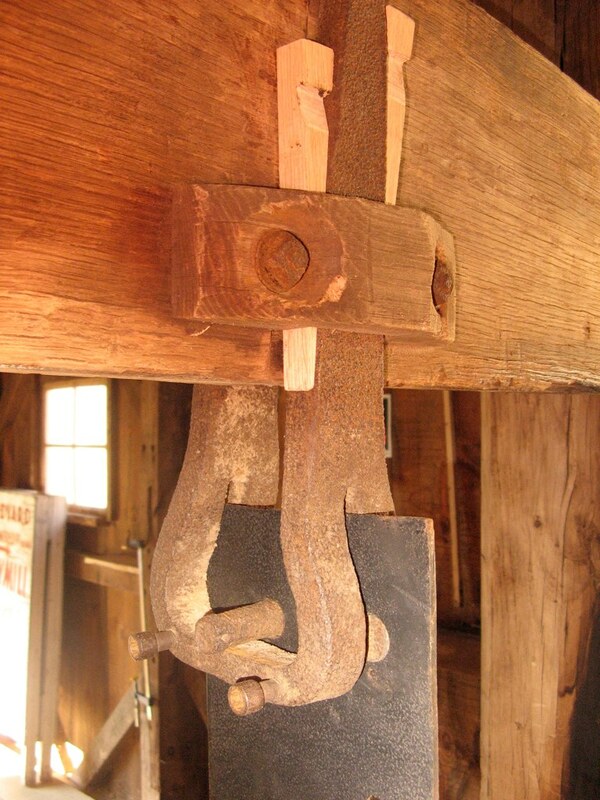 An iron drive arm, the pawl, connected to this post pushes against iron teeth around the perimeter of the "rag wheel," causing it to slowly rotate. Adjustments, not illustrated, can make this arm advance the rag wheel by 1, 2, or more teeth per up stroke of the saw. 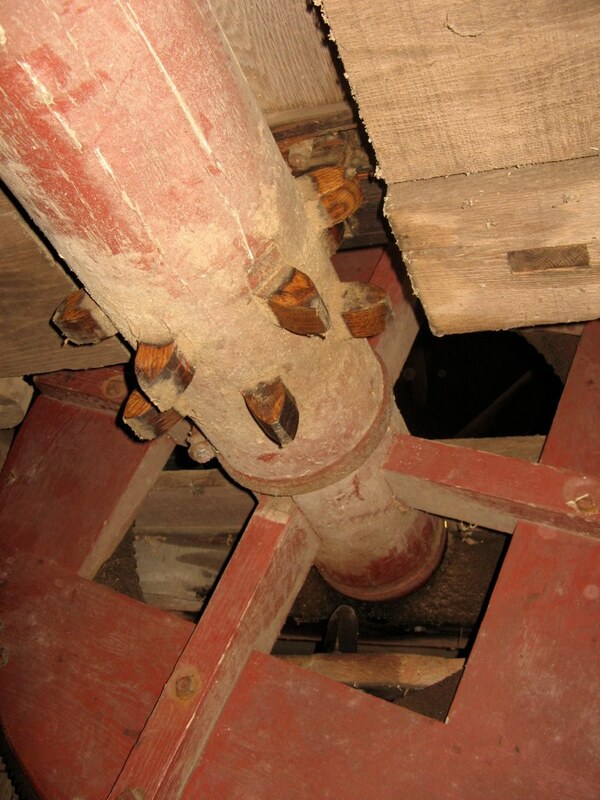 The rag wheel is connected to a spindle, shown in the photographs: one shows the spindle before it was installed during the restoration and the other shows it in place below the main floor of the mill. Extending from the spindle are large wooden teeth that engage regularly spaced 1 1/2" (?) by 3" (?) by 4" (?) sockets on the bottom of the log carriage. As the rag wheel is advanced with each up stroke of the saw, the spindle rotates. Its teeth engage the slots on the underside of the carriage and move it and the log forward in small increments synchronized to the upward movements of the saw sash. In the second video, the sawyer turns a wheel to open the lower gate on the water tank, providing water flow to drive the turbine. Sometimes the saw must be manually started to overcome the inertia of the flywheel and friction of the saw frame on its guides. Note in the video and photograph how log is not sawn through to the end so that the board falls off. By leaving about 2 to 3 inches at the end unsawn, a board remains attached to the log. Consequently as more boards are cut the log does not become lighter to the point that it would begin to jump as the saw moves up and down. At the end of a cut, the drive pawl for the rag wheel is disengaged, stopping the carriage advancement as the saw continues to oscillate. By engaging a reversing gear to the gearing on the side of the rag wheel, the carriage is moved back to its starting position at the front of the saw. For safety reasons, the saw is then stopped. The log is then shifted over by hand by a distance equal to the thickness of the new board to be cut. The log is secured to the carriage by driving iron "dogs" into the end as seen in the above photo. When all is secure, the handwheel is turned admitting water into the turbine and the saw is nudged into action. The rag wheel drive is engaged to start the next cut. Cut boards are stacked with 3/4" spacers added between layers to let air circulate and promote drying. Most fresh logs contain free water saturating empty wood cell spaces as well as water molecules that are loosely bonded to cellulose in the cell walls. Free water is the first to evaporate off and then the bonded water will leave, yielding a moisture level dependent on ambient relative humidity. Air dried boards in unheated buildings will usually equilibrate to about 12 to 14 percent bound water. A good rule of thumb in air drying lumber is to wait a year for every inch of thickness to reach this equilibrium which is suitable for general construction. For furniture making, moisture levels should be about 7 to 9 percent. Moving lumber into a heated building can achieve this after several more months. 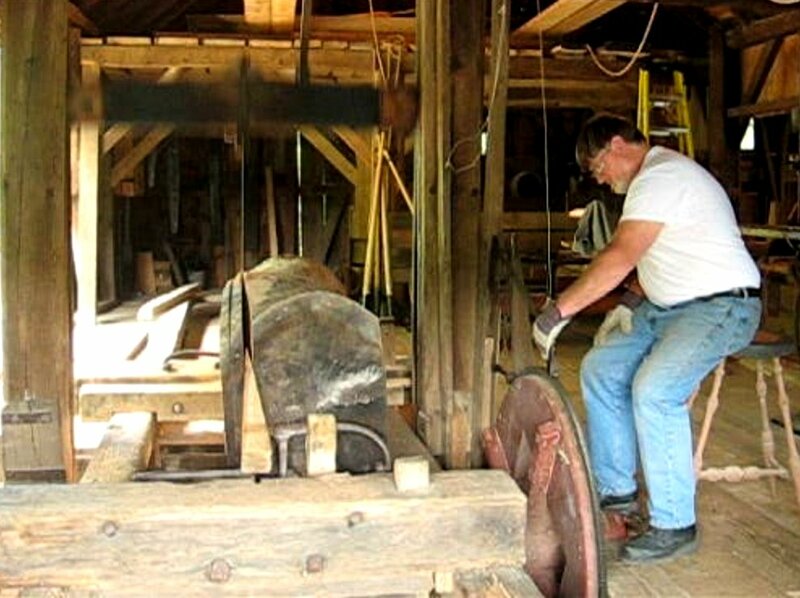 Modern commercial sawyers use a kiln to dry lumber, shortening the time from sawing to marketing. 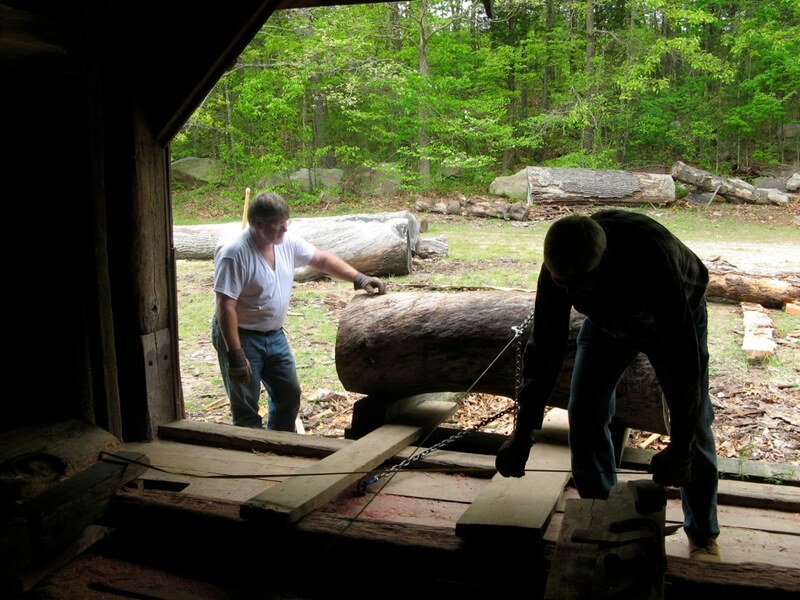 Logs are obtained from local sources and typically include red and white oaks, pine, cherry and hickory, but other hardwoods typical of southern New England may be cut. The mill can handle logs up to 20' (?) in length and around 40" in diameter, but typically the volunteer staff prefers thinner and shorter ones (in range 24" in diameter by 8' to 12' long) which are easier to handle. 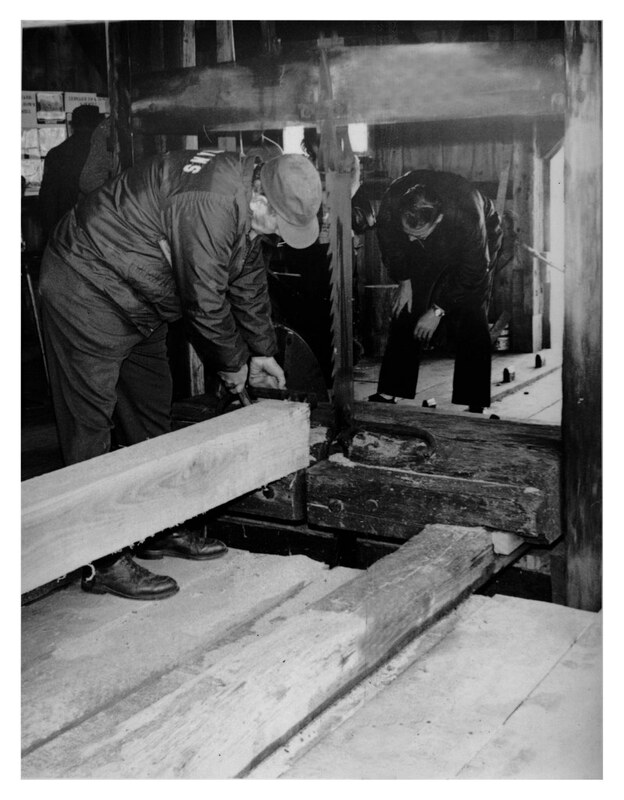 Using peaveys and cant hooks, a log is rolled onto a ramp that passes from ground level to the floor of the mill, a height difference of about 24". 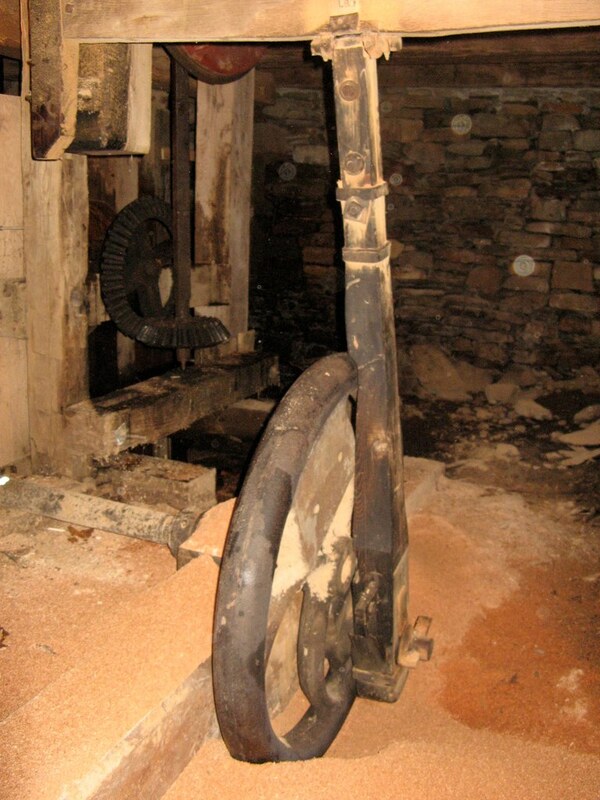 As a concession to modern times (and old back muscles), a small electric power winch and cable are used along with peaveys to bring large logs into the mill. The log is loaded onto the original log carriage from the earlier mill. After finding a stable position, iron "dogs" are driven into the log to prevent its shifting as the saw cuts. The carriage moves forward when the saw is operating to carry the log into the saw at an adjustable rate of advance per stroke. The first cuts "true" the log. Often logs are curved or tapered from one end to the other. The sawyer will sight down the blade and along the length of the log, judging how much to remove in the first cut. The first piece to come off will not be uniform in thickness and one side will be round, not flat. The rounded side will be bark and sapwood. This is discarded, unless it contains an interesting growth, a burl, that might be good starting material for a turner or carver. After the first cut, the log has a flat side. 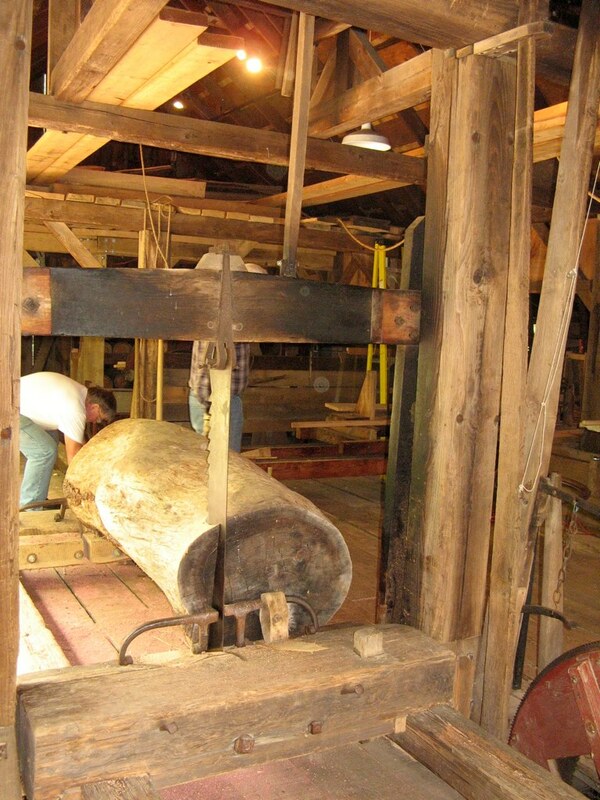 It is rolled 90 degrees on the carriage to put the flat side down and a second cut, like the first, is made, starting to square the log. How do you move the log carriage back after a cut? 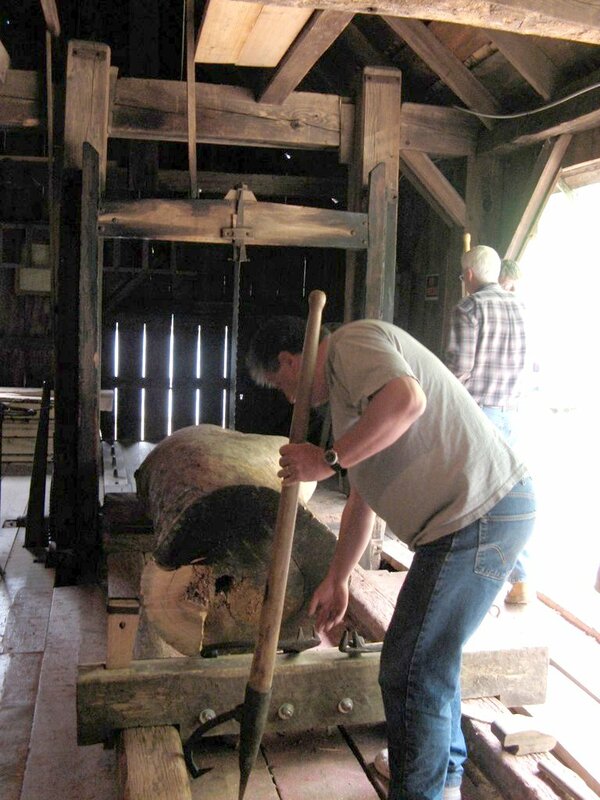 As the cut nears the end of the log, the carriage is stopped by lifting the pawl off the rag wheel. The carriage is then reversed by pulling a lever that engages the reversing bevel gear to the teeth on the side of the rag wheel. The sawyer calls out "backing" and everyone scrambles as the several hundred pounds of log and carriage move backwards to the starting position. Power to move the carriage comes via the reversing gear from the water turbine and flywheel shaft. The lower gate on the water tank is then closed to stop the saw and the log is moved over for the next cut.